The current ACI code and many other codes permit the moment magnification method for design of slender reinforced concrete (RC) columns. Manually, the design/analysis procedure is tedious, so that the codes state a pre-prediction if the column is slender or not. In other words, before starting design codes provide slenderness limits to be considered to decide whether a column is slender or not. This work will concentrate on the slender RC column provisions of the latest ACI Code. Using this method some columns are found to be short. In the proposed method of this work, it is found that some of these “short” columns are found to be “long”, thus needing moment magnification. Since column analysis/design represents dealing with one of the most critical parts of RC buildings, this proposed magnification is presented in this work. The city of Baghdad is located in the central Mesopotamian plain of the Twin Rivers. According to the geological surveys, the whole area is covered by recent sediments of alluvial origin, deposited by successive floods of Tigris and Euphrates rivers, and by wind action. Since Baghdad city is the capital it surrounded by network of industrial areas for different purposes and this, affect the environment. Solid wastes generated from both animal and domestic sources can significantly impair drinking, irrigation, recreational water, other water sources and soil in rural and urban areas therefore it must be monitored and controlled very well to protect the wild life and environment and this represent the goal of research tool used for this purpose is remote sensing and Geographic Information System (GIS) due to their ability of monitoring and analyzing large amount of data. The techniques demonstrated in this research include procedures for developing regional spatial data into a coordinated GIS database, characterizing and identifying wildlife habitat, quantifying and assessing land use change, pollution due to changes in land use and demonstrating the application of these GIS and modeling methods for assessing cumulative environmental effects associated with landuse change. Geographic Information System (GIS) and remote sensing techniques are used to monitor the environment in Baghdad city especially the industrial waste. Using GIS and remote sensing techniques in the environmental assessment give a quick and low cost. Preliminary investigation can be considered as aiding tools to the traditional and detailed investigation procedures. إنّ مدينةَ بغداد واقعة في وسطِ سهلِ الرسوبي المتكون بفعل النهرين الخالدين دجلة و الفرات. طبقاً للمسح الجيولوجي، المنطقة كاملة مغطاة بالرواسبِ ِ مِنْ الأصلِ الغرينيِ،المتكون بالفيضاناتِ المتكرّرةِ مِنْ نهرِ دجلةِ والفرات وبعملِ الريحِ. لان مدينةِ بغداد العاصمةُ أحيطتْ بشبكةِ المناطق الصناعيةِ للأغراضِ المختلفةِ وهذه تُؤثّرُ على البيئةِ في بغداد.ان للمخلفات الصلبة تأثير على تلوث مياه الشرب و السقي و مياء الترفيه و مصادر المياه الأخرى والتربة في المناطق الحضرية والريفية لذلك يجب مراقبتها و السيطرة عليها بصورة جيدة لحماية الحياة البرية و البيئة وهذا يمثل الهدف من البحث نظام المعلومات الجغرافية (GIS) وتقنيات التحسس النائي ْ تُستَعملُ لمُرَاقَبَة البيئةِ في مدينةِ بغداد لقدرتهما على مراقبة و تحليل كمية كبير من البيانات.القنيات المستعملة في هذا البحث تتضمن ما يلي نقل البيانات المكانية الى قاعدة بيانات,تمييز الحياة البرية للبيئة , ربط التلوث بالتغير في استعمال الارض و اعطاء نموذج لتقييم التاثيرات البيئية المرتبطة بالتغير في استعمال الارض. إستعمال نظام المعلومات الجغرافيةِ وتقنياتِ التحسس النائي في التقييمِ البيئيِ يوفر تحقيق كلفةِ سريعةِ ومنخفضةِ ويُمْكِنُ أَنْ يُعتَبرَ كأداة مُسَاعَدَة إلى ألادوات التقليديةِ التفصيلية الاخرى. The experimental and analytical behavior of various mixes of roller compacted concrete (RCC) using different materials is presented in this work. This work is divided into two groups of experiments. In the first group a reference mix was prepared using local materials (cement, sand, aggregate). Mechanical and dynamic properties of reference mix with and without admixtures have been obtained. Also, this series includes a study of the various variables affecting the mechanical and dynamic properties of RCC. In this work, the effect of cement content, water/cement W/C ratio and type of aggregate on the mechanical properties has been studied. The optimum mixes which have good properties obtained from the first group of study were used in the second group. In this work, the effect of admixtures and type of admixtures (steel filings, metakaolin, fly ash, lime, rice husk and concrete wastes) on the mechanical properties has been studied. The analysis of results showed that using steel filings improves the mechanical properties when replacing the sand by steel filings in (5, 10, 15 and 20) % by weight. The ultimate compressive strength at 7 and 28 days is higher by 13.2 and 24.7%, respectively, than the compressive strength using sand only. Partial cement replacement by mineral admixtures like metakaolin with (10, 20 and 30) %, lime with (4, 6, 8, 10, 20 and 30) %, fly ash with (10, 20 and 30) % and rice husk with (4 and 8) % decreases the strength and other properties at early age of 28 days by about 12.02% when using metakaolin by 20% and about 12.5% when using lime by 10 %. 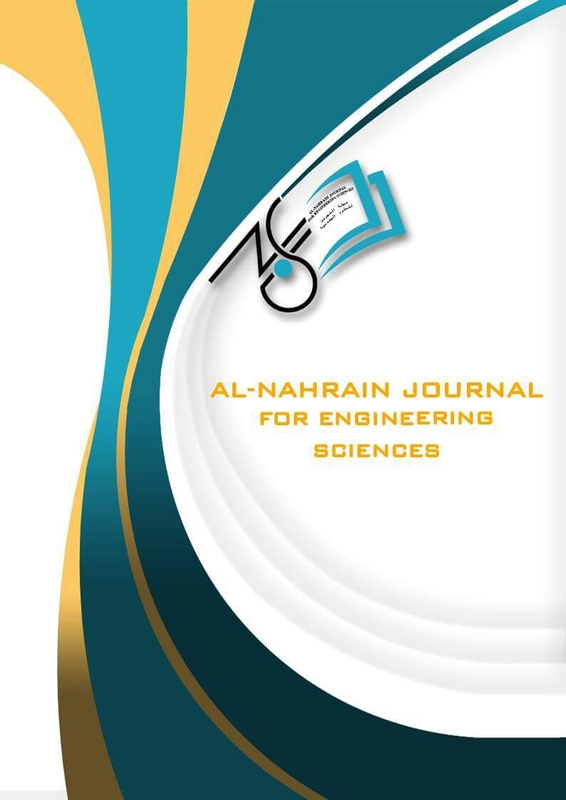 This research involves the effect of both vertical and horizontal spacing, as well as the length of the reinforcing strips, on the structural behavior of a model reinforced soil retaining wall. The tests were carried out on a small-scale laboratory model, in which uniform graded sand was used as a fill material. It was placed at a high dense state; raining technique was used for this purpose. The sand was reinforced with thin dipped Aluminum strips. The size of these reinforcing strips was chosen sufficient enough to prevent rupture mode of failure. The retaining wall was presented by a plastic transparent sheet. The results showed that the horizontal spacing is more significant parameter on deflection of the wall as compared to the vertical spacing of the reinforcing strips. The critical values of the horizontal and vertical spacing with respect to this research were 20 and 10 cm respectively. A short length of reinforcement proved to cause appreciable deflection of the wall, even under close horizontal and vertical spacing يتضمن هذا البحث تاثير كل من المباعدة العمودية والافقية، بالاضافة الى طول شرائط التسليح ،على السلوك الانشائي لنموذج جدار ساند لتربة مسلحة. انجزت التجارب على نموذج مختبري صغير استخدم فيه رمل منتظم التدرج كمادة املائية . وضع الرمل في حالة كثافة عالية باستخدام طريقة تمطير الرمل . سلح الرمل بشرائط من الالمنيوم الرقيق ، اختيرت ابعادها المقطعية بحيث يكفي لمنع الفشل بالقطع . مثل الجدار الساند بلوحة شفافة من البلاستيك. اظهرت النتائج بان مباعدة الافقية اكثر تاثيرا على انحناء الجدار الساند مقارنة بالمباعدة العمودية لشرائط التسليح . وجد بموجب هذا البحث بان القيم الحرجة للمباعدة الافقية والعمودية لشرائط التسليح هي 20 و10 سم على التوالي وهذا يبين بان الطول القصير لشرائط التسليح يؤدي الى انحناء متزايد حتى في حالة استخدام مباعدة افقية وعمودية قليلة لشرائط التسليح. Retaining wall --- vertical spacing of reinforcing strips --- horizontal spacing of reinforcing strips --- length of reinforcing strips --- deflection. The absence of universally accepted solutions in the structural concrete codes for the design of reinforcement in shells gives rise to the problem of calculating the required reinforcement in these structures. The constant development of the computer’s performance and storage capacity combined with the powerful numerical methods reveal the need for a standard procedure to design shells subjected to membrane and flexural forces. In this paper, the solution for the design of the required reinforcement in concrete shells is presented based on a complete iterative computational algorithm to design shell elements subjected to combined membrane forces and bending moments. In the design equations, the reinforcement will contribute to tension and the concrete compression struts parallel to the crack direction will contribute to compression. The reinforcement is assumed to have two orthogonal layers placed in the top and bottom surfaces with appropriate covers. Each reinforcement layer has reinforcing bars placed orthogonally. For the concrete compression struts, the stress is assumed to be uniformly distributed in the depth of Whitney’s stress block. This design algorithm is achieved by developing a design code (DRCSH) based on a complete iterative computational algorithm. This program can be used as a stand-alone version, to determine the load carrying capacity of critical points in reinforced concrete panels, plates and shells; and to verify the design code on the element level, five experimental models are designed. The designed elements give calculated ultimate strengths from 7 to 18% higher than test results values, except one model, which confirms the adequacy of the design algorithm, and the developed design code. أن غياب الحلولِ المقبولةِ عالمياً في ألمدونات الخرسانيةِ ألأنشائية لتصميمِ حديد ألتسليح في المنشأت ألقشرية تُسبّبُ بعض ألصعوبات لحِساب التسليح المطلوبِ في هذه المنشأت. التطوير المستمر في أداءِ الحاسوبَ وقابلية الخزنِ المتزامنة مع الطرقِ العدديةِ الكفوءة أدت ألى ظهور ألحاجة ألى أكتشاف طرق لتصميم حديد ألتسليح للمنشأت ألقشرية ألمعرضة ألى أحمال مختلفة. في هذا ألبحث، تم تقديم طريقة حسابية متتابعة كاملة لتصميم حديد التسليح للعناصر ألقشرية ألمعرضة لأحمال غشائية و عزوم. في معادلاتِ التصميمَ، يساهم حديد ألتسليح في تحمل قوى ألشد ألمتولدة أما ألخرسانة ألموازية لأتجاه ألتشققات فأنها تتحمل قوى ألانضغاط ، تم افتراض حديد ألتسليح بشكل طبقتين متعامدتين و ضعتا في ألسطحين ألعلوي والسفلي مع غطاء حرساني مناسب.كل طبقة من حديد ألتسليح تتكون من قضبان حديد تسليح متعامدة. تم أعتبار كل طبقة من حديد التسليح عمودية على الطبقة الأخرى.كما افترض ان الأجهاد لأنضغاط عمود ألخرسانة موزعاً بأنتظام خلال عمق منطقة أجهاد (Whitney) تم تنفيذ طريقة التصميم بكتابة برنامج تصميمي (DRCSH) اعتمادا على طريقة حسابية متتابعة، هذا البرنامج يمكن استخدامه لا يجاد قوة ألتحمل في المناطق الحرجة للألواح وألقشريات ألخرسانية ألمسلحة. و للتأكد من صحة برنامج التصميم تمت عملية تصميم لخمسة نماذج سبق أن فحصت عملياً. أظهرت نتائج التحليل أحمال فشل أعلى بمقدار 7-18% من أحمال الفشل العملية، عدا حالة واحدة. مما يؤكد يمثل صلاحية ألطريقة و برنامج التصميم ألمعد. Some of the electric networks adjacent countries are linked to either the alternating current lines or to direct current lines, that is really depends upon the geographic distance of the linking points and the amount of the used current. In view of rapid and huge increasing of electric power consumption and to shorten the value of losses inside transferring operation besides the electric system steady. Accordingly and due to all we have mentioned the direct current transmission has been established in high voltage for long distance. These lines can be used when the linking points are far- off, and when the frequency for the two required systems are different. Therefore transformation stations are being used at both ending sides to transfer from alternating to direct current and vice-versa. Also a (HVDC) system can be constructed according to stages in proportion with the voltage development and the load requirement. There is always the need to maintain the transformation voltage at ultimate possible value in order to have a high efficiency operation. In this paper the transmission line was represented by using MATLAB program for two different lengths (300,600) Km & different firing angles then comparison is held between these two lengths according to efficiency & economical view. هناك بعض الاقطار المتجاورة تربط الشبكات الكهربائية مع بعضها البعض لغرض رفع درجة الوثوقية بالشبكة وتعتمد ربط هذه الشبكات على المسافه الجغرافية بين نقاط الربط وكمية القدرة المطلوبة. مع التقدم العلمي والحاجة الى المزيد من نقل الطاقة الكهربائية وتقليل الخسائر نتيجة النقل برزت الحاجة الى استخدام نقل الطاقة الكهربائية بأستخدام التيار المستمر وخاصة للفولتيات العالية والمسافة الطويلة وكذلك عند اختلاف الترددات بين نقاط الربط . لذا يتم استخدام محطات للتحويل في كلا نهايات نقاط الربط.وهي تقوم بتحويل التيار المتغير الى التيار المستمر بأستخدام المعدلات والمستمر الى متغير بأستخدام المغيرات والعكس بالعكس وحسب متطلبات الحمل مع مراعاة الناحية الاقتصادية من حيث الفولتيات العالية والمسافات الطويلةللحصول على الكفاءة المطلوبه. في هذا البحث تم تمثيل خط نقل نموذجي باستخدام برنامج خاص بالحاسبة الاكترونية و بطول (300)(600) كم ولمختلف زوايا القدح و المقارنة بينهما من حيث الكفاءة والناحية الاقتصادية. There is an increasing demand for higher data rates and higher quality in wireless communications that has motivated the use of multiple antenna elements at both the transmitter and the receiver sides of a wireless link. Space-time coding (STC) deals with the design of good codes of multiple antenna wireless systems. A new proposed orthogonal code is designed and presented in this paper as an improved design of delay diversity for multilevel space time coding with multiple inputs and multiple outputs. The code is based on using two signals transmitted at different rates in order to remove the problems that appear from different types of fading due to multipath channel and to reduce intersymbol interference (ISI) between the symbols. The transmitter and the receiver are designed to encode and decode the proposed orthogonal code through the frequency selective and flat fading channels. Time invariant rapidly varying fading channel is included ; that the path gains change for each symbol. The detection is non coherent STC that neither the receiver nor the transmitter knows the channel propagation coefficients. Quasi-static fading channel with coherent STC is also included, that only the receiver has knowledge of the channel through training symbols is available at the beginning of each frame of the receiver. The method gives coding gain, diversity gain as well as the design of the proposed code for three or four transmitting antennas with low complexity. Macro- and microscopic levels of analyses are used to capture the behavior of a built-in beam made of a unidirectional fiber-reinforced polymeric material. Finite element formulation basing on the displacement approach and minimum potential energy principle is carried out in the longitudinal direction of the beam to determine the vertical displacements (deflections) at various sections, stresses and strains. A unit cell method in micromechanical analysis based on the finite element method is used to define the state and distribution of the stresses induced in transverse sections. Hexagonal fiber-matrix packing system is idealized for the problem. The package of ANSYS 5.4 and a Matlab program are used to solve for the macro- and micromechanical analyses. To examine the validity of the presented method, it is applied to analyze a beam made of matrix and fibers with the same elastic properties the results are then compared with those obtained by using a method used for isotropic materials given that properties , the convergence noticed is verifying the validity of the analysis method adopted by the current work. The application of a pack cementation of Y-doped chromium and silicon coatings on low alloy steel type-T22 yields a significant improvement in the oxidation resistance. Steel-T22 was coated with Y-doped chromizing-siliconizing. Diffusion coating was carried out at 1050 oC for 6 h under an Ar atmosphere by simultaneous Y-dopded chromizing-siliconizing process. Cyclic oxidation tests were conducted on the coated steel-T22 alloy in the temperature range 300-500 oC in H2O for 100 h at 5 h cycle. . The oxidation kinetics for coated system in H2O was found to be parabolic .Oxide phases that formed on coated system are SiO2 and Cr2O3. Finite element results show that there is a good agreement between FEM and experiments results. ان تطبيق طريقة التغليف بالسمنتة لتغطيات الكروم-السليكون المحورة باليتيريوم على الفولاذ المنخفض السبائكية نوع T22 يؤدي الى تحسين كبير في مقاومة الأكسدة. حيث أن الفولاذ T22 قد خضع الى طلاء كروم-سليكون المحوّر باليتيريوم . و تم تنفيذ الطلاء الانتشاري عند (1050oC) و لمدة 6 ساعة تحت أجواء الآركون باستخدام الطلاء الآني للكروم-سليكون المحور بالتيريوم. و تم اجراء اختبارات الأكسدة الدورية على الفولاذ المطلي في المدى الحراري (300-500) في بخار الماء و لمدة 100 ساعة عند دورة مقدارها 5 ساعة. و لوحظ أن آليات الأكسدة تسلك سلوك القطع المكافئ . اما أطوار الأكسدة فانها تتضمن تكوّن SiO2 و Cr2O3 . نتائج تحليل العناصر المحددة تشير الى التطابق مع النتائج التجريبية. The importance of penetration and perforation in to targets in both military and civilian applications has made it the subject of many investigations. But the bulk of these investigations was experimental rather than analytical or numerical because of complexity of the governing equations. Hence most of the existing models are either mathematically rigorous or so simplified that they neglect many important parameters. Moreover, weight and cost are among the most important consideration in the design of perforation resistant systems (containment shields). Therefore, the present investigation has focused on the perforation and penetration of relatively thick metallic targets by rigid cylindro-ogival projectiles. To achieve the experimental part of this work a locally manufactured compression device was built for this purpose where the target plate was subjected to biaxial compression load of about 0.6 of its buckling load. A life 7.62 mm ammunition with steal projectiles have been used to impact the targets at 400 and 600 m/s thus the exit velocity in terms of the impact velocity and the total work done at the target was derived for the case of biaxial compression. Comparison of the experimental and the analytical results showed a good agreement while targets in the state of compression showed about 80% improvement in penetration resistance.إن أهمية تطبيقات ظاهرة التغلغل والاختراق في الأهداف في المجالين العسكري والمدني جعلت منه موضوعا لكثير من الدراسات والأبحاث ,ولكن أكثرية هذه الدراسات كانت تجريبية بسبب تعقد العلاقات الرياضية لوصف الظاهرة ولذلك فان اغلب النماذج التحليلية المتوفرة إما معقدة جدا أو مبسطة إلى درجة بحيث أنها تهمل الكثير من العوامل المهمة المؤثرة , هذا من جانب, ومن جانب أخر فان الوزن والكلفة هي من أهم العوامل المؤثرة في تصميم منظومات مقاومة الاختراق (دروع الاحتواء) .وعليه فقد تركز البحث الحالي على دراسة ظاهرة تغلغل قذائف صلدة اسطوانية مخروطية الرأس لأهداف معدنية سميكة نسبيا ومعرضة لانضغاط أحادي الاتجاه في حالة وثنائي الاتجاه وقد بلغت قوة الانضغاط تقريبا 0.6من حالة حصول الانبعاج .ولتحقيق الجانب العملي ثم بناء جهاز انضغاط خاص لهذا الغرض وتم كذلك استخدام عتاد حقيقي عيار 7.62ملم مع رؤوس فولاذية مع تحقيق سرعة ارتطام مقداره 400 و 600م/ثا .بالإضافة إلى ذالك فقد تم اشتقاق نموذج تحليلي لحساب السرعة النفاذية (سرعة الخروج من الهدف) بدلالة سرعة الارتطام والشغل الكلي المنجز على الهدف وذلك في حالة كون الهدف معرض إلى انضغاط ثنائي الاتجاه .تبين من مقارنة النتائج النظرية والعملية بوجود تقارب جيد في هذه النتائج بالإضافة إلى وجود تحسن بنسبة حوالي 80% في مقاومة الأهداف المعرضة لانضغاط إلى عملية الاختراق. Tread of the tire is occasionally dislocated due to sever running on the road. Retreading is necessary in this case, and retread rubber compounds are made from a blend of NR/BR by using several additives like Activator Accelerator such as Zn salts of high molecular fatty acid (LAUREX) & homogenizing agents (Struktol-MS) produced by Uniroyal, Delayed Action Accelerators type Thiazoles and Sulfenamides such as (AMAX & MORFAX) produced by Vanderbilt.. insoluble sulfur, Pine Tar and others. An infinite number of rubber recipes are possible in blends. The best properties of each components are selected to achieve a blend having a wide spectrum of properties (recommended for retreading compounds) which is superior to that of the individual component and also economically competitive. The effect of using different levels(0.6,0.65,0.85pphr) of accelerators such as (AMAX & MORFAX) are enhancing the phsico-mechanical properties(tensile strength, modulus,shore hardness and abrasion resistance index), and the Activators Accelerator (LAUREX & Struktol-MS) in the rubber compounds are evaluated in such away that LAUREX is more affective in recipe no.3(2.5pphr) than the same level of Struktol-MS, so that it is making use of preparing suitable retreading rubber compound بين حين واخر تظهر مشكلة انخلاع الجزء الملامس للارض (المداس) عن جسم الاطار الرئيسي بسبب ظروف الخدمة القاسية على الطريق.وحتى تتم اعادته للخدمة لابد من اعادة اكساء الاطار retread من جديد. عادة ما تستخدم عجينة المطاط الطبيعيNR مع عجينة مطاط البيوتدايينBR في اعادة أكساء الجزء الملامس للأرض للإطار بعد تعرضه للانخلاع وتستخدم ايضا العديد من المواد الكيمياوية المضافة مثل منشطات المعجلات كأملاح الخارصين ذات الأحماض الشحمية عالية الوزن الجزيئي مثل الــ (LAUREX) وعوامل المجانسة مثل الــ (Struktol-MS) والمنتجين من قبل شركة Uniroyal للكيمياويات. وتستخدم أيضا المعجلات ذات التأثير المؤجل وهي من أنواع الثايزولات والسولفين امايد مثل الـ (AMAX & MORFAX) والمنتجين من قبل شركة Vanderbilt لتكنولوجيا المطاط والإطار. كما تستخدم الكبريت غير الذائب insoluble sulfur والى ما هناك من المواد الإضافية الأخرى اللازمة لعجينة المطاط الخاص باعادة اكساء الإطار المخلوع. يمكن الحصول على عدد كبير من العجنات المطاطية حسب تغيير نسب الخلطات, وقد تم اختيار العجنات او الخلطات التي تزودنا بأفضل طيف من الخواص الملائمة لمطاط اعادة الاكساء وذات جدوى اقتصادية. تمت دراسة تأثير المعجلات (AMAX & MORFAX) المذكورة في أعلاه بعد استخدامها بنسب مختلفة(0.6,0.65,0.85pphr) وتحليلها بما يفيد في تحسين الخواص الفيزيوميكانيكية مثل(قوة الشد, ومعامل المرونة, وصلادة شور, ودليل مقاومة الحك). كما اظهر البحث ان استخدام محفزات المعجلات(LAUREX & Struktol-MS) قد بين ان الـ LAUREX في العجنة الثالثة وبدرجة التحميل (2.5pphr) اكثرفعالية من الـ Struktol-MSبنفس درجة التحميل مما يساعد في تحضير مركب مطاطي يلبي استخدامات إعادة أكساء الجزء الملامس للارض retread للإطار. In this paper, the processes of 3D LASER scanning and dimension inspection were simulated for certain dimensions object. The scanning operation is divided into two major modes, Searching Mode and Scanning Mode. In scanning mode two sub-processes (scanned point validation and plane fitting) are introduced, i.e. to find the plane which contains most of scanned points. The final step is the decision making, which gives a decision about acceptance or rejection of the scanned manufactured object. The proposed algorithm is successfully applied to seven cases. One of them which has the exact dimensions and this case has been accepted. The other six cases, which have different dimensions, have been rejected.تم في هذا البحث محاكاة عمليات المسح الليزري بالأبعاد الثلاثية لجسم محدد الأبعاد. أن عملية المسح تتكون من طورين هما طور البحث و طور المسح وفي هذا الطور تتم عمليتين ثانويتين هما التحقق من النقطة الممسوحة ليزريا و عملية مطابقة المستوي ، أي أيجاد المسوتي الذي يحتوي على أكبر عدد من النقاط الممسوحة. أما الخطوة الأخيرة فهي التحقق من أبعاد النموذج المنتج فأذا كان ضمن الأبعاد و الدقة المسموحة يتم قبول النموذج و بعكسه يتم رفضه. لقد تم التحقق من الخوازرمية المقترحة بتطبيقها على سبع حالات من النماذج المنتجة أحداها كانت مطابقة لأبعاد الجسم القياسي حيث تم قبول هذا النموذج أما بقية الحالات كانت لنماذج مختلفة الأبعاد و قدم تم رفضها جميعا. In this paper, Raman amplification characteristics in photonic crystal fibers (PCFs) are investigated in details. Performance comparsion between PCF-based Raman amplifier and other conventional fiber-based counterparts is presented. The simulated results reported here can be used as a guide line to design PCF-based Raman amplifier that outperforms the conventional fiber amplifiers. Raman gain as high as 33 dB can be obtained with a well designed PCF even at low pump power of 300 mW. في هذا البحث تم البحث بالتفصيل عن خصائص مضخم رامان المصنوع من الفايبر البصري البلوري مع مقارنة ادائه مع مضخمات رامان المصنوعة من الفايبرات الاعتيادية. افادت الدراسة انه يمكن استخدام نتائج المحاكاة التي وثقت هنا لتصميم PCF-FRAs ذات مواصفات تفوق مثيلاتها المصنوعة من الفايبر الاعتيادي، كذلك يمكن الحصول على ربح قدره (33dB) عند قدرة ضخ صغيرة (300 mW) اذا صُمم الفايبر بشكل جيد. In this study we introduce a solution for wound healing controlling therapy by using a monochromatic pulse diode laser light 650 nm, 50% duty cycle and 1 MHz. Many studies proved last years a positive effect of diode laser light application in wound healing process. In this paper we study the effect of time illumination parameter on healing process. For this kind of therapy, a 650 nm diode laser used. Its original electronic circuit drive was improved to give pulsed output laser of 50% duty cycle, 1 MHz. Twenty male mice, three months old were usd in this study (photo-biostimulation). The wound was made on bilateral back sides of each mouse, two sessions of illumination carried everyday for 12 and 18 minutes during 15 days time. This study was compared with our previous study set for 5 minutes for one session therapy in 1st and 2nd day of healing process. أثبتت الدراسات المختلفة في السنوات الأخيرة التأثير الايجابي لضوء الليزر ثنائي الوصلة في شفاء الجروح. في هذا البحث تمت دراسة عامل مدة الإضاءة على عملية شفاء الجرح باستخدام ليزر ثنائي الوصلة بطول موجي 680 نانومتر حيث تم تغيير دائرته الالكترونية الأصلية للحصول على نبضات ذات 50%دورة عمل و تكرار 1 ميكاهرتز. استخدم لهذا الغرض عشرون فأراً بعمر 3 أشهر لدراسة تأثير التحفيز الضوئي على عملية شفاء الجروح التي استحدثت على ظهر كل فأر من الجهتين و عرضت للإضاءة بالليزر يومياً لمدة 12, 18 دقيقة لحين شفاء الجرح تماماً و قورنت نتائج هذا البحث مع دراسة أخرى سابقة لنا تم فيها الإضاءة باستخدام نفسه لمدة 5 دقائق ليومين فقط بعد حصول الجرح و حصلنا على نتائج ايجابية في تسريع شفاء الجروح. In this study, high performance concrete mixes were produced by using high range water reducing agent(Glenium 51) and also by using 10% silica fume or 10% high reactivity metakaolin as a partial replacement by weight of cement. Three cement contents (350, 450, and 550) kg/m3 were used through this study. A total of 330 (100 mm) cubes, 66 (150×300 mm) cylinders, and 132 (100×100×400 mm) prisms were cast and cured to the required age of test. Compressive strength, rebound number, ultrasonic pulse velocity and dynamic modulus of elasticity were investigated for all mixes at 7, 28, 90, and 120 days age. Results of the destructive test of compressive strength and non–destructive tests (hammer, ultrasonic pulse velocity, and dynamic modulus) are statistically analyzed by using SPSS Ver.15 software to study the possibility of assessing the compressive strength of high performance concrete by using non–destructive tests. Simple and multiple linear regression analysis of the obtained results leads to the proposed statistical models for evaluating the compressive strength by using one or two or three of the above non–destructive tests. Analysis of variance (ANOVA) and t–test was also used to investigate the adequacy of the statistical models. The statistical models were subjected to adequacy checks at a selected level of significance of 5%.تم في هذه الدراسة انتاج خلطات خرسانية عالية الاداء باستخدام مضاف مقلل للماء بدرجة متفوقة وكذلك باستخدام ابخرة السليكا المكثفة بنسبة ۱۰% او الميتاكاؤولين عالي الفعالية بنسبة ۱٠% كتعويض عن جزء من وزن السمنت ، كما و تم استخدام ثلاث محتويات من السمنت (۳٥۰،٤٥٠ و٥٥٠) كغم/م۳. تم صب و تهيئة ۳۳۰ مكعب بابعاد (۱٠۰ملم) ، ۱۳۲ موشور بابعاد (۱٠۰×۱٠۰×٤۰۰ملم) و٦٦ اسطوانة بابعاد (۱٥۰×۳۰۰ملم) و قد عولجت جميعها بالماء لغاية عمر الفحص المطلوب.اجريت فحوصات مقاومة الانضغاط ، رقم الارتداد، سرعة الموجات فوق الصوتية، معامل المرونة الديناميكي باعمار ۷،۲٨،٩٠،۱۲٠يوم. تم تحليل نتائج الفحص الإتلافي ( مقاومة الانضغاط ) والفحوصات اللاإتلافية (رقم الارتداد ،سرعة الموجات فوق الصوتية ، معامل المرونة الديناميكي) احصائياً باستخدام برنامج SPSS Ver.15 لدراسة امكانية تقييم مقاومة الانضغاط للخرسانة عالية الاداء باستخدام الفحوصات اللاإتلافية. التحليل الانحداري البسيط والمتعدد الخطي للنتائج المستحصلة ادى الى النماذج الاحصائية المقترحة لتقييم مقاومة الانضغاط باستخدام فحص واحد او فحصين او ثلاثة من الفحوصات اللاإتلافية. كذلك تم استخدام تحليل التباين ((ANOVA و(t–test) لتحري كفاءة النماذج الاحصائية.